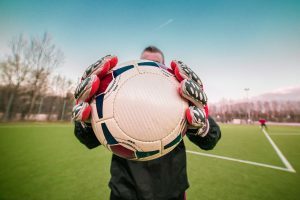 1 Why is a good heading technique important in soccer? 3 Where can I find soccer heading drills? Although the beautiful game may be called 'foot' ball in many parts of the world, the ability to head the ball correctly is often underlooked and is a powerful part of the game, so today we're going to look at heading drills to improve this underrated soccer skill. Why is a good heading technique important in soccer? If you have soccer players who are strong and know how to head the ball in your team, then you have a massive advantage, not only in defense but in attack as well. In recent years, think about the versatility of Didier Drogba for example, who was a powerhouse heading talent up front, but also saved Chelsea on many an occasion from his defensive heading ability. The same can be said for Cristiano Ronaldo... he may be famed for his dancing feet, however, check out the number of top quality headers he has scored with and how much value he adds as an extra defender for corners. The same can be said for powerful defenders coming forward into the opposition's box to head home a corner or free kick... I immediately think of John Terry in this position who has scored an incredible 39 Premier league goals for Chelsea as as center back! Always try to meet the ball on your forehead, between the top of your eyebrows and your hairline. If you use the top of your head you will be looking at the floor, will lose the flight of the ball and the ball will fly off in any direction. Having strong neck muscles is important, but when you head a soccer ball you should use all of your body rather. Learn to use your arms and your body as a lever as you explode in to head the ball. If you want to get height on the ball, head the bottom part of the ball and this will raise its trajectory - good for defensive headers or goal line clearances. If you're just after power then try to head the ball in its center. Getting your feet in the right position is particularly important for defensive headers. Make sure that you have one foot leading in front of the other when you take the ball. When going for a high header against the opposition your natural instinct is to close your eyes, however, practice keeping them open as this will give you more control, will help you avoid the opponents and will give you a better reaction time. Yep, you don't want to go into a competitive challenge with your mouth wide open as you can easily bite your tongue. Keep your mouth shut and your teeth clenched to be as safe as possible. Where can I find soccer heading drills? Well, I've been training my soccer players for many years and have learned a variety of different exercises and drills that I practice with players of different ages and ability. We'll have a look at some of these in more detail later, but I would also recommend the Epic Soccer Training System, which has some great tips to improve your heading ability. I’ve included one of the videos here to show you the type of content you’ll receive. In this video Matt gives us some more advice on how to head a soccer ball with power. Watch how the coach disciplines his players in this video into using their whole body to snap and attack the ball with aggression. Focus is on gaining height and distance in this drill so it gets over the midfield line. This drill simulates a real game scenario when you could be clearing a goal kick and long ball into the box. This is a fun heading drill to practice your defensive headers and ensure that the ball is cleared with good height and distance. Similar to header volleyball, the idea is to keep the ball in the air, but getting over the top of the line of defenders by the net. The next set of drills are aimed for the other end of the pitch, and are targeted at your strikers and training their third foot (their head)! Most top strikers should be grabbing at least 20% of their goals from their head, so you really need to practice your finishing technique and become comfortable using your head. Simple drill to get you used to taking a header and finishing whilst you are on the move. Practice your accuracy by calling for the ball and finishing into either the near or far post. Put the theory into practice and play a game with your buddies where you can only score using your head. In this heading drill the focus is on accuracy, power and timing. The players take it in turns to score as many points as possible within a minute, getting extra points for diving headers and rebounds. Use this simple game of 2 on 2 to practice your heading technique. I use this final attacking heading drill a lot with my teams as it pulls all of the different aspects of heading technique into one drill and is great for both defenders and attackers to practice. Key for the attacker is to try and find space, move quickly and finish instinctively, whereas the defender needs to try and block their run and get first to the ball as it comes in. The final technique we're going to look at today is the 'flick-on' or glancing header. This can be used to devastating effect in attack as it can completely wrong foot defenses as both the trajectory and direction of the ball is changed, causing panic in the goal line. To perfect this technique, keep your eyes open, tilt your head backwards slightly and have a very loose soft neck to gently touch / kiss the ball and help it on its way. You can use this to great effect from near post corners, free kicks and defenders can even use this to head the ball over their own bar. OK, so for some of you, you're not going to have a team of players willing to serve balls to you all day long so you can selfishly improve your heading technique and beat them in the next soccer game. This video takes you through 6 simple heading drills that you can do against a wall to help you develop your overall heading technique, accuracy and control of the ball. This is also great to improve your jumping and co-ordination when taking a ball in the air. So, as you can hopefully see now, mastering the header is something that you can all achieve, as long as you're willing to put in the time and effort to practice this. This is a crucial skill to have both for defenders and attackers as a large part of the modern soccer game is played in the air, and you want all of your team to be able to compete with the best. So that's all from me today. Hopefully, you've found this article useful and can benefit from my years of coaching around the globe. So, you've got plenty of soccer heading drills to practice now, so remember... no excuses, go train and have fun!